These pictures are courtesy of my son... the CAMera Guy. He took them a few years ago with his Gramma... and I love them. Of course, I do love pelicans anyway. They are part of my first Florida experience... and when Florida comes to mind I automatically think pelicans and palm trees. I never thought that I would actually live here though... and that those pelicans and palm trees would be a part of my everyday life. Yes, I am a lucky girl. Last summer on the beach we watched them fly so close to the water that their wings would just skim the surface... or we'd laugh as they spotted a fish in the depths of the ocean and dive straight down. Bombers! Cam would yell... and he dubbed it the the summer of peace, love and pelicans. Pelican starts with P... and they make me happy. I was so sorry to miss a couple more weeks of Jen's Z to A game... hopefully I am right back on track. I'm headed there now... to see what other things start with P! my mom used to collect pelicans! she still has them displayed! i love them too! those are great pictures! he did good! 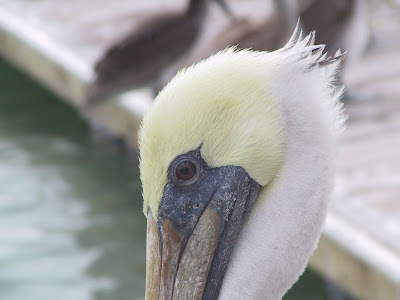 Great Pictures of the Pelicans- Cam did a Perfect job of capturing them. 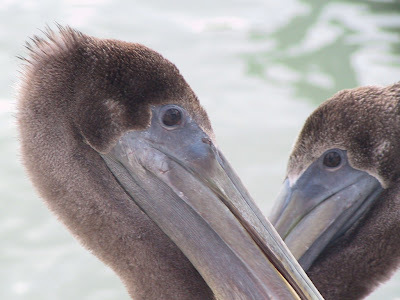 Pelicans are comical birds. I wish they would frequent our beaches here up north. So much more character than the french-fry-stealing gulls that we have! There are just some things about some places that you visit (or live) that are just wonderful! I remember sitting on the Florida beach watching those pelicans--they are amazing and I would have LOVED an opportunity to feed them! 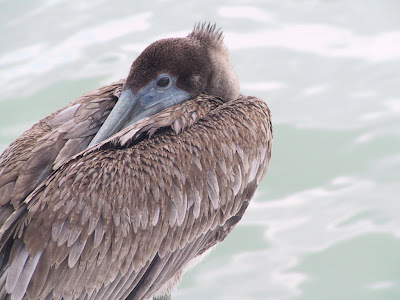 Beautiful pictures and when I think of FL, I think of pelicans too! Hope you have a good afternoon. What great pictures! And I love pelicans, too. They really CAN be pretty! I wish we could import pelicans to Ohio - they are fun to watch. Nice choice! Good P word. Can't say that I ever met a Pelican in Person! You son is a good Photographer...Perhaps he will make it a Profession! I love these pelican pictures. The first shot is classic, and he looks so shy. I totally agree with eveyone else, and your son has a future in photography. I also would like to see them up north more, the seagulls are not a good alternative. But on the other hand, I don't think Florida would be quite the same without the exclusiveness of the pelicans down there.